As you may already know, we are a “full service” automotive facility. This means that we not only do general auto repair and performance upgrades, we also do trailer hitch installation, custom fabrication and welding. We are your true one stop shop when it comes to your car or truck. Depending on your towing needs and vehicle application, the installation of a trailer hitch may be as simple as bolting on the parts to your bumper or you may need to do some welding to the frame of your car or truck. We are professional experts in this department and carry all the major brands. Regardless of your car or truck, call us and we will let you know if there is a towing kit available to install on your vehicle. Automotive Excellence Inc. also specializes in custom fabrication and welding projects. 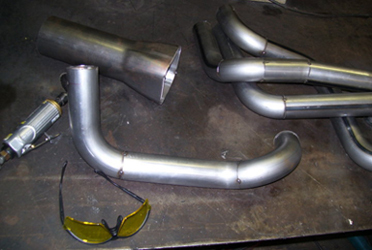 We have fabricated custom headers for a GTO and also reconfigured headers on a 1970 Maveric among other similar projects. One of our favorite fabrication projects however, was the reproduction of an original muffler for a 1915 Benz, this client called everywhere and no one was able to help him until he found us. The owner of this antique car was extremely happy, just like all of our clients. We also do minor welding for anything from bike racks to furniture. We like to tell our clients that from a beach chair to a wheel chair, no job is too small. Not all trailer hitches are alike. Depending on what you are attempting to tow and the type of vehicle you have there may be many options available or there might not be an application for your vehicle. Call us and ask questions before you attempt to do this yourself. At Automotive Excellence Inc. your safety is our Number 1 priority. Class I Hitches – This type handles the lightest loads for a trailer hitch. A Class 1 trailer hitch can handle a gross trailer weight (GTW) of up to 2,000 lbs., and a maximum tongue weight of 200 lbs. The hitch may be a simple drawbar-type hitch or step bumper-type hitch. This type of hitch is often used on smaller cars, smaller pickups and smaller vans for bicycle racks, camping racks, and light-duty towing. Class II Hitches – These are for loads of up to 3,500 lbs. GTW and 300 lbs. tongue weight. 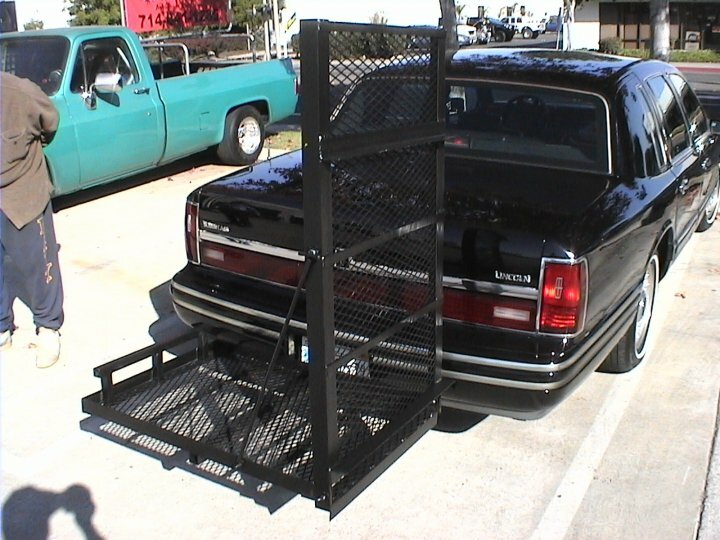 Class II hitches are for a small boat trailer, snowmobile trailer, motorcycle trailer or camper. This type of trailer hitch is appropriate for larger cars, full-size vans, full-size pickups and SUVs. We carry hitches that are designed specifically for your vehicle, and we have some universal class II trailer hitches as well. 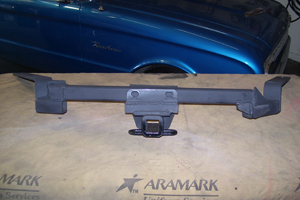 Class III Hitches – This type of trailer hitch can handle up to 5,000 lbs. GTW and 500 lbs. tongue weight. This type of hitch generally has a 2-inch rectangular receiver and is considered the “standard” type of hitch for many towing applications. 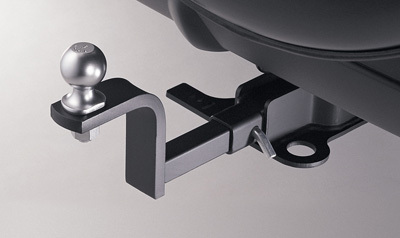 For the most part, our class III hitches are designed specifically for your vehicle. However, there are also some universal-fit class III trailer hitches available. Class IV Hitches – These hitches are for loads up to 10,000 lbs. GTW and 1,000 to 1,200 lbs. of tongue weight. This type of hitch is usually a weight-distributing hitch. 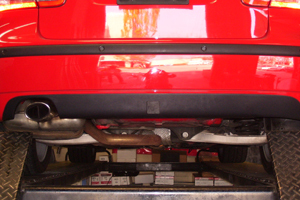 We carry many class IV hitches that are designed specifically for your vehicle. Class V Hitches – For extra heavy loads greater than 10,000 lbs. GTW and more than 1,200 lbs. tongue weight. This type of hitch is usually a weight-distributing hitch. This type of hitch may have up to a 2-1/2 inch receiver with a 3/4-inch pinhole. Clients who typically order this type of hitch use it for towing a car trailer, horse trailer, camper or large boat. 5th Wheel and Gooseneck Hitches – For really heavy towing we can install 5th wheel and gooseneck hitches that mount in the bed of your pickup truck. We also install the wiring harness and wiring kits for trailers that have their own brakes and brake lights. If you need trailer accessories or hitch covers, call us as well. We can help you with all your trailer and towing needs. Take some time and check out a few of the projects we have worked on in the past. Below you will see examples of the type of fabrication and welding projects that we have done to help our clients. Follow us on Facebook and Youtube to keep up to date with our most recent projects, pictures and updates. 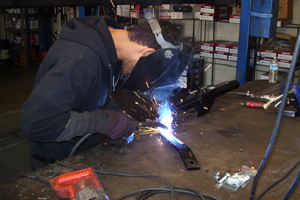 Fabrication and Welding – We even made a wheel chair rack for a client! Fabrication – This client needed a mobile work bench. We built it for him. This tool box was built for FINE LINE SUSPENSION. Jason travels to race tracks and works on dirt bike suspensions on site. He needed a self contained work station to put in his trailer and take to the track. He had a basic idea of what he needed. We designed it and built it for him. He was happy, because he had a mobile work station he could take to the track and an extra work station at his shop. 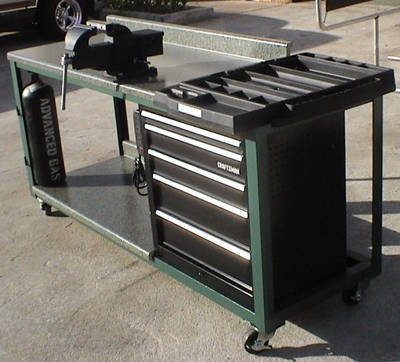 It includes a work surface, a tray for small tools on top and a complete locking tool box. It was built on heavy duty wheels to handle the weight of a full tool box and still be able to move easily.